Introducing 5th Season Michigan Inspired Designs inspired by and for those with the combined passion for Michigan and the outdoors. Thomas Riverman of Hamilton, Michigan designed the logo and hopes to have more designs in the future with fishing, boating, etc. Look close, you can see the Michigan map! The design is copyrighted and the decal and t-shirts are printed in Michigan. The high quality decals are great for windows, laptops, etc. 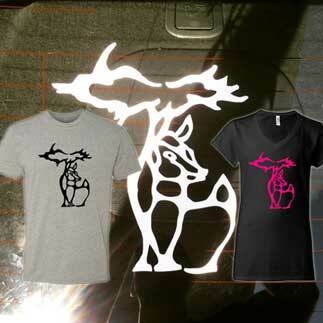 Sport a comfy tee at deer camp this year with a Michigan Deer Design t-shirt. The t-shirts are available in unisex crewneck and ladies vneck styles in a variety of colors. Comfortable, casual and loose fitting, these t-shirts will quickly become one of your favorites. Made from cotton, it wears well on anyone. The the bottom and sleeve hems are double-needle stitched for extra durability. The Michigan Inspired Deer Design T-Shirt makes a great gift for the hunter in your family! Update! Hoodies are now available. Also tshirts, long sleeve shirts, and hoodie available with Michigan Geese Design. Check it out!